Hublot, the Swiss luxury watchmaker continue to write its future for 5 more years together with Ferrari, the best-known racecar and sports car manufacture in the world. And today, they meet again right before the F1 Chinese Grand Prix in ShanghaiTM. Mr. Loic Biver, Hublot General Manager of Greater China, celebrated the Big Bang Ferrari collection launch in China as well as the grand opening of the renovated Hublot boutique at Shanghai Plaza 66, with Mr. Sebastian Vettel, F1 world champion and Scuderia Ferrari Driver and Maurizio Arrivabene Scuderia Ferrari team Principal. When the ground-breaking racecar spirit meets the extraordinary watchmaking expertise, the encounter strongly reminds the distinctive concept of to be “first, unique and different”! Started in November 2011, the partnership between Hublot and Ferrari has entered its 6th year. Drawing on the shared quest of innovation, quality and performance, the two houses that, upon contact with each other, have already demonstrated the power and strength to create synergies between two different worlds. 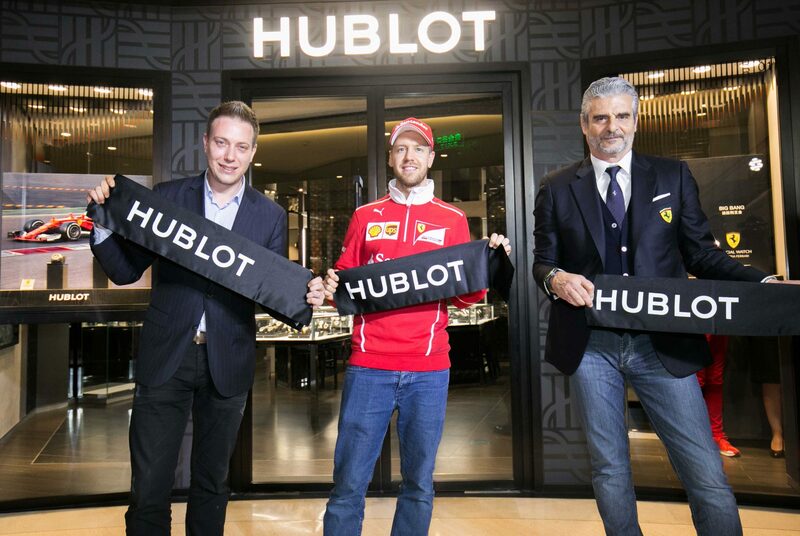 This unique feeling that encourages continual improvement, perfectionism and transcendence is the positive inspiration that unites Hublot with Ferrari. Two houses that share a perpetual quest for innovation, excellence and performance and that, by coming together, constantly push back the boundaries. A tandem with a shared philosophy—that of design in the service of function. The minute counter and date window at 3 o’clock are designed like a car tachometer and style of the date is inspired by a Ferrari speed dial. The Prancing Horse logo features discreetly at 6 o’clock. At 9 o’clock, the seconds counter is in the shape of an air extractor. On the crown side, the case middle features a red line detail, recalling the iconic groove to the rear of the LaFerrari model. The elongated push-buttons are fixed to a rotating staff like the pedals on a car. On the other side of the case, the name “Ferrari” is emblazoned in bright red across the watch’s now iconic sandwich-like case construction. The new design perfectly accentuates the curves of the Big Bang, down the smallest detail. With the elements of a Ferrari car, now the design offers a unique material – uni-directional carbon. The Big Bang Ferrari is equipped with an UNICO movement –Hublot’s in-house Manufacture movement. The mechanical power of the movement echoes the exciting heart-beat of extreme speed. 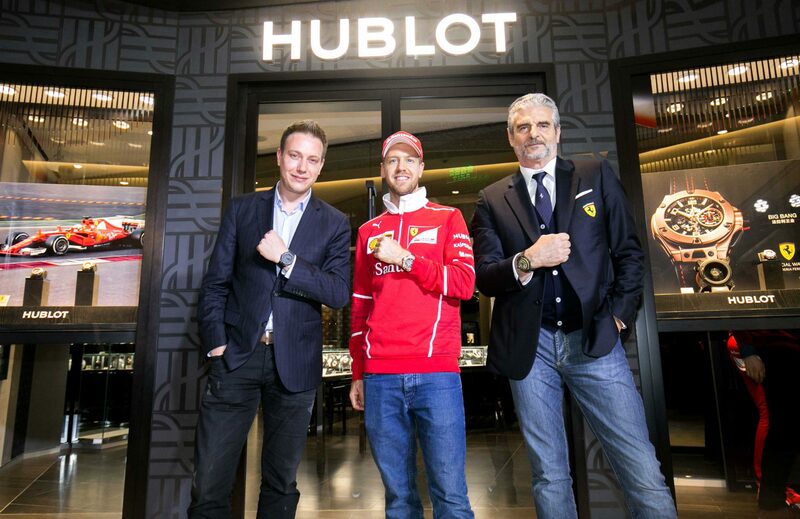 At the event, guests witnessed the grand opening of the renovated Hublot Boutique at Shanghai Plaza 66. The boutique’s design exhibits the brand’s DNA of luxury and innovation combined with its Art of Fusion concept of unexpected combinations. The boutique’s décor reflects Hublot’s use of unique materials, which maintains a prominent role in the brand’s watchmaking design. The 85 square meters interior, conveys a contemporary style, with black lava stone and wood floors, graphite-colored leather furnishings, glass and polished stainless steel fixtures. Painting on the wall with pop art elements invites explosive and conflict effect in the palace of time. The jumping color added a fashionable and modern texture to the otherwise cold design. The space reveals a fusion between premium materials and a luxurious yet modern aesthetic. 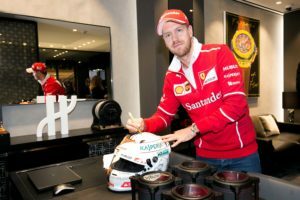 From Nyon in Switzerland to Maranello in Italy, how does one summarise what cannot be summarised, so prolific is the partnership making the Swiss watchmaking brand the partner of the Italian manufacturer. While the Swiss watchmaker is renowned for its pioneering and audacious spirit, the driving force behind its achievements has been stimulated by this collaboration with the Prancing Horse. With the Big Bang Ferrari, Hublot created a series of patented innovation in materials, including Magic Gold and Red Ceramic. Then came the MP-05 “LaFerrari—a superwatch in homage to the eponymous supercar, an extremely complex movement, a historic 50-day power reserve and a design conceived with Ferrari, presented in 2016 in a full sapphire case. 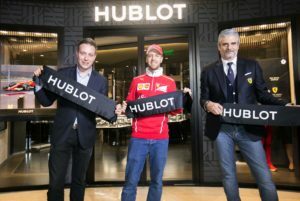 Hublot keeps its role as the official watch and chronometer of Ferrari and Scuderia Ferrari, and will also maintain its sponsorship of GT sporting activities, like the Ferrari Challenge. 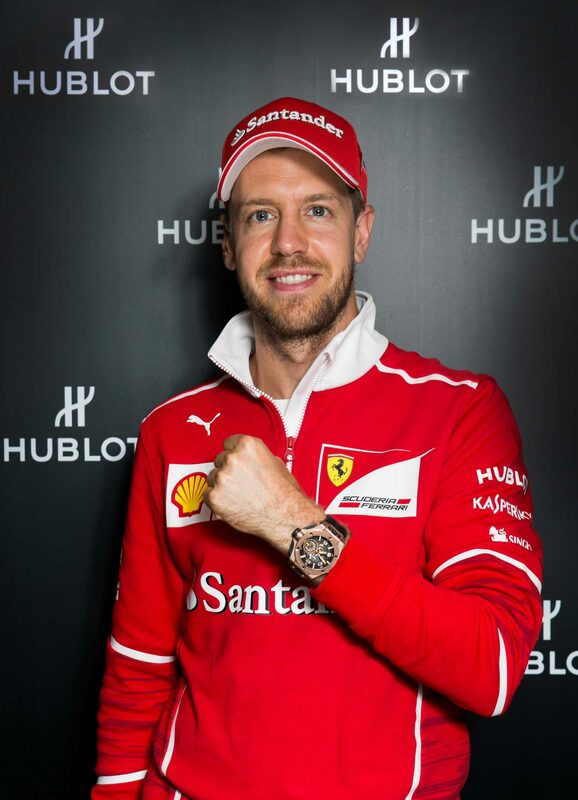 Visible on the cars, helmets, gloves and race suits of the F1 drivers, Hublot lives at the pace of the star team’s competitions. The unprecedented magic will fire up Ferrari fans from all over the world!